Billy Dees has been such an important part of HumorOutcasts from the start. I first met Billy on Twitter, and I have watched his blog and his podcasts blossom. A multi-talented individual who produced a great trailer for How to Write and Share Humor. For new and established authors, trailers and videos are becoming an essential part of book marketing. Meet this man as he can help you! Also, listen to his podcasts which are now on Spreaker, Stitcher and iTunes and check out his videos on YouTube. Tell us about Billy Dees (background, family, hometown, marriage, etc. I was born in Canton, Ohio. The main attraction in Canton is the Professional Football Hall of Fame. The HOF is growing rapidly and is on its way to becoming a bit of a complex. Dad was a mechanical engineer, an amateur Civil War expert, and an audiophile. Mom had a small watch repair shop, was an avid reader, and WWII enthusiast. I was an only child. Is there such a thing as “only child syndrome?” There must be because everybody says I have it. My dad went to great lengths to make sure that I wasn’t spoiled but to this day I enjoy my alone time. I am confident that I could be in solitary confinement and it wouldn’t bother me one bit. I was married for the first time just several years ago. I have a loving wife who understands all of my foibles. She is a very skilled professional in the medical industry. Do you have a background in radio/podcasting/video? Dad and I had a good common interest in audio products when I was growing up. Most people today enjoy popular media devices but audiophiles are somewhat of a select group. Back in the seventies how big your speakers were and how powerful your amps happened to be were signs of your manhood. I was lucky in that electronics came naturally to me. As a teenager these skills became an instant source of income for me. 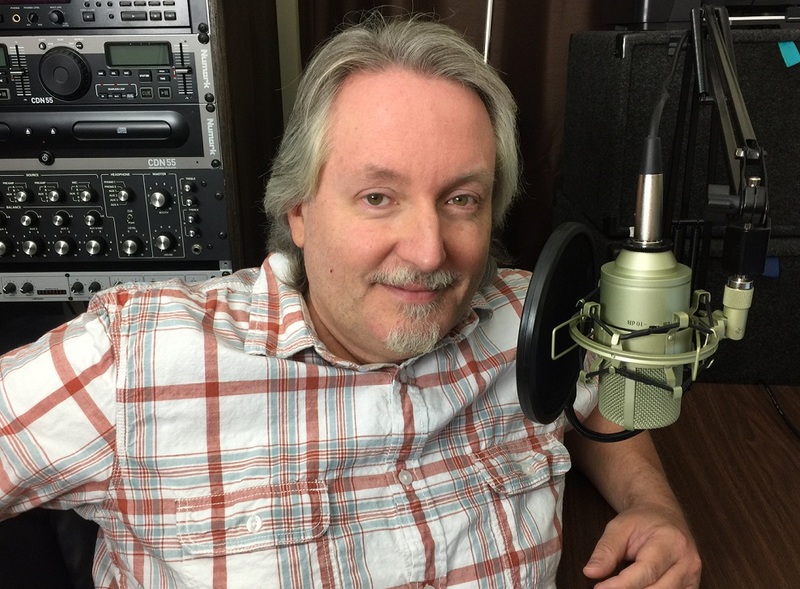 By the time I was in my early twenties I had my own sound business which provided recording services, sound reinforcement, and voiceovers. Through the nineties I was on the ground floor as computer technology grew into widespread use and was incorporated into the audio/video industry. Podcasting has been around a long time, however, has risen in use incredibly over the past few years. Considering my background doing voiceovers and audio work in general, along with my enthusiasm for the internet, podcasting has been a great fit for me. You also have a performing history with comedy? Do you still do stand up? What are theatrical experience do you possess? I haven’t done stand up in a while but probably should. I was kind of theatrical as a comedian as I would do characters and voices. As a comedian you are a writer, performer, and director. That makes standup harder than what most people realize. On the other hand, comedy is truly open to all and is one of the few areas of show business where age and looks are irrelevant. As a matter of fact, I am not aware of too many leading-man types who have been enormously successful standup comedy guys. How did your past experiences lead you into podcasting and audio and/or video work? As a whole I am not a true artist in that it is unlikely that I will cut my ear off in a fit of creative frustration. By the same token I am not a total geek. Tinkering with computers all day long gets old fast. However, I do feel I am a combination of both. I know enough about technology to be able to incorporate it into a creative process. What do you like most about being in the audio and podcasting field? Verbal communication is becoming a lost art. Social media is inundated with selfies capturing a plethora of expressions and captions. Most online videos rely on jump cuts during the commentary and effects to aid with the fashioning of segues. To be fair, there is a place for these types of media. However, most of the content is self-serving and self-aggrandizing. The ability to speak and share complex ideas, concepts, and emotions was a key development in our evolution as human beings. Somewhere along the line we lost an appreciation for that skill. I believe podcasting has become a medium which allows the power of the spoken word to emerge in the world of online media. Are there avenues in audio/video that you are pursuing now? Yes, there are two. For one I am trying to help people create digital media for their online endeavors. This often ties into sales and marketing which I enjoy as well. Second, I am trying to market myself as an intellectual resource. Granted, some of my material has an edge but frankly I do not believe you can grow as a writer or commentator when your material is nothing but blue skies and chirping birds. Sooner or later you have to hit some tough topics. I try to keep the two entities of what I am doing separate. I do not want my style of how I present myself to get confused with what may be best for my client’s needs. The long and the short of it is that I am sure many of my digital media clients want nothing to do with some of the subjects I cover. Your blog is quite popular. It is a mix of humor and pretty deep thought? How are you able to marry the two? Getting back to theatrics, it is a matter of getting into character. There are certain subjects that inherently lend themselves to absurdity and the clown character emerges. On the other hand, sometimes delving beneath those same subjects can tell us a lot about ourselves. The various points of view that we all have about the origin and the context of human existence and indeed all life. What are your goals for audio/video and podcasting? I definitely want my business to grow helping others create digital media and content in the forms of photography, video, and audio production. That is first and foremost. I also want to continue to market myself as a commentator and entertainer, although much of that relies on crossing paths with the right people at the right time. The best thing you can do is be ready when the opportunity comes and that is what I am trying to do. Nice to get to know you better, Billy! Continued success to you. Thanks so much Roxanne! Great fraternity of writers on here, so glad to be a part! I enjoyed this interview. Billy, I wish you continuing success. Thanks Bill, it is much appreciated! Thank you Donna, you and your staff of writers has been very kind and generous to me over the years. It is much appreciated.